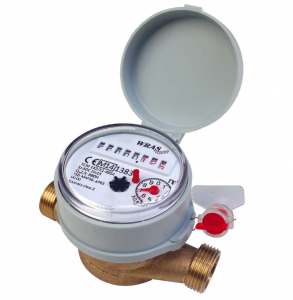 Single-Jet budget range of mechanical water meters available in sizes: 1/2" & 3/4", with limited pulse output options. Suitable for a variety of metering applications including secondary domestic billing and light industrial use etc. The single-jet water meter is mainly used as a secondary meter in residential and small industrial applications or for inclusion in beverage machines and similar applications. It’s simple design makes it a product with a competitive price and highly reliable design. The principle of operation is characterised by a single directed stream of water directed towards a turbine mounted in a radial position within the body of the meter. The rotation of the turbine transmits the motion to the magnetically coupled display mechanism allowing the measurement of the volume of water passing through the meter to be recorded and totalised, then output as a scaled pulse if required..
Single-jet Cold Water Meter 1/2" BSP :: Nuts, Tails, washers included.